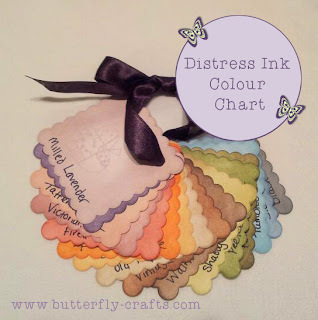 Like many crafters I love my Tim Holtz Distress Inks for papercrafting and I have collected quite a few from the various ranges. 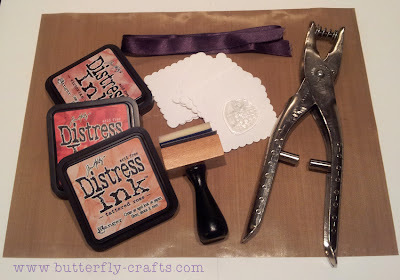 I love Distress Inks because they are great for stamping but also painting with if you use a water brush. The problem however with the inks is that you cannot get a true colour representation from the lid of the ink pad. To rectify this, I decided to make a colour swatch which I will keep with my inks and can reference when stamping but something that I could also add to as I purchase more inks - which I most definitely will! The colours all together just look so pretty! 1. 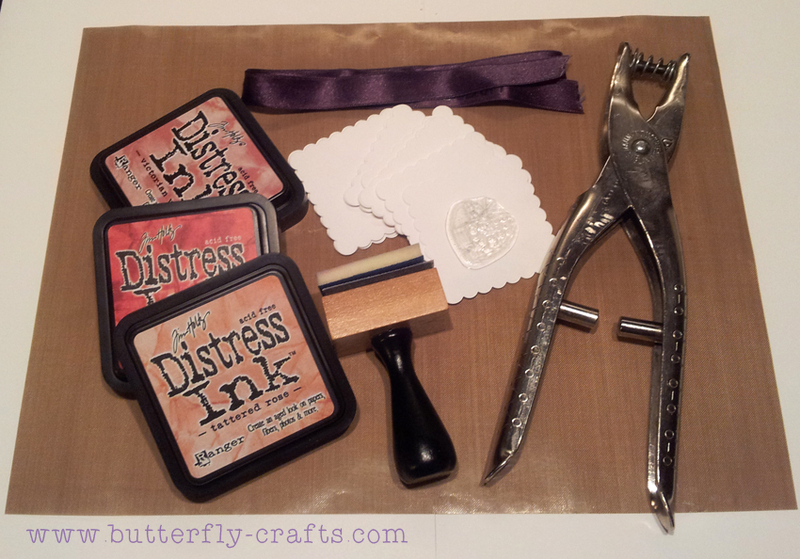 First of all punch out the shape of your choice in the white stamping card for how ever many inks you have. 2. Using the blending sheet and the blending tool ink the card shapes making it darker around the edges and gradually lighter in the centre so that you can see the range of colour shades you can create with one ink pad. 3. Using the rubber stamp, stamp the image in the centre of each colour swatch so that you can see what a stamp in each colour will look like. 4. 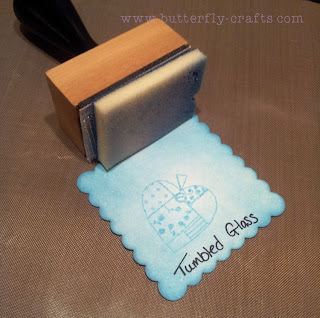 Write the name of the ink colour along the edge of the card shape. 5. Repeat steps 2, 3 and 4 for each ink that you own. 6. Punch a hole in the corner of each shape. 7. Arrange the colours into groups - eg all the blues, greens etc and then tie a ribbon through to create a loop. Alternatively you could add the cards to a metal ring but I think a pretty purple ribbon is the best option! I hope this will be a helpful addition to your craft organisation techniques and save you a little time with knowing exactly what the colours will look like!